Mr. Hunter is currently the Managing Director of Strategic Capital Allocation Group LLC (“SCA”), a firm he founded on October 1, 2001. Previously, Mr. Hunter was with Prudential Securities, Morgan Stanley and Smith Barney. 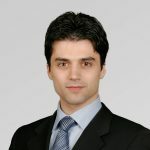 Throughout these affiliations, he has built a unique corporate and institutional consulting practice that concentrates on achieving maximum capability for risk-controlled assets. Mr. Hunter has consulted on over $11 billion in SCA client assets with a goal of enhancing those assets towards improved levels of efficiency. His clients have included a renowned hospital system encompassing endowment, ERISA pension plan and funded depreciation account portfolios, foundations, trusts, and ultra high net worth individuals. Prior to his tenure at Smith Barney, Mr. Hunter’s experience includes his own consulting firms for derivative portfolio management and international relocation policies and systems on behalf of multinational companies and professional service firms. Clients included McKinsey & Company and Northrop. Mr. Hunter’s initial consulting experience was in competitive strategy assignments while at the Boston Consulting Group and Bain & Company. He focused on market segmentation and merger and acquisition issues for maximizing shareholder value. Mr. Hunter holds a B.S.E. degree in Aerospace and Mechanical Sciences from Princeton University. At Princeton, Mr. Hunter designed and initiated the Program for Science, Technology and Environment that combined curricula from the Woodrow Wilson School for Public and International Affairs and the Engineering School. Mr. Hunter received his M.S. in Urban and Policy Sciences from Stony Brook University where he was instrumental in developing and implementing systems solutions to complex public policy problems for New York City and the Nassau/Suffolk County Planning Commissions. Mr. Hunter serves as a member of The Atlantic Council of the United States. He is also actively involved with alumni affairs for Princeton University. Mr. Hunter is also a CIMA-designated member of the Investment Management Consultants Association. Mr. Hunter serves on the Editorial Board of the IMCA Investments & Wealth Monitor.